Haven't even started building the neck on the current build, but thinking ahead (and wanting some time to do some practice before working on the FB), I'm trying to decide what type of inlay material to use. Obviously, MOP is traditional (especially for a Lester shaped guitar), and I really like the gold MOP that is available from LMI. The guitar will have gold frets, pups and tuners, (sapele neck with a jatoba fretboard) and the gold MOP will continue that theme. 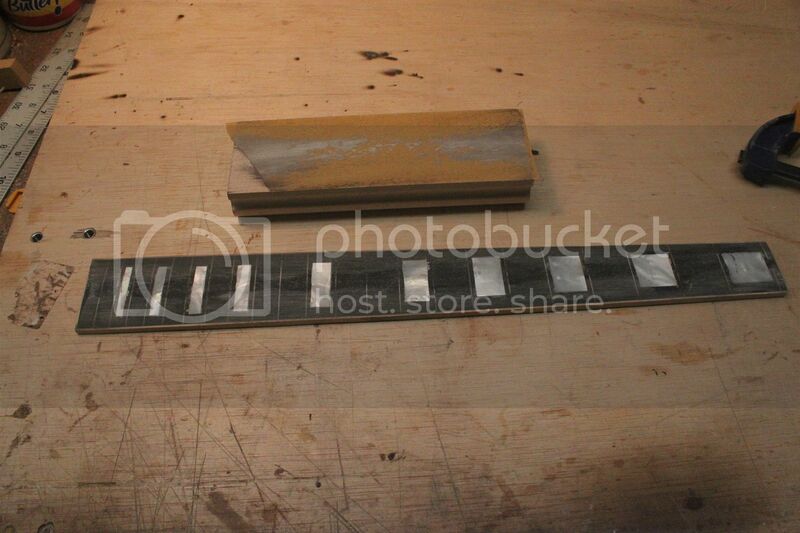 LMI also offers pre-cut rectangular MOP fret markers (the FBM6 product). They would be much easier, eliminating the need to cut out the inlays, but I'm not super thrilled about that plain rectangular shape, and they're not gold. I could modify the rectangles, either cutting them into trapezoids, cutting them diagonally into two pieces so as to leave a diagonal slash across each marker, etc. I also believe that MOP can be dyed with alcohol-based dyes, so I'd need to experiment with that if I go that route. I could also use contrasting wood, and LMI also has some interesting faux turquoise. If I go with the turquoise, I think I'd need to work in some kind of inlay on the body to tie the blue of the FB inlay to the body, as everything else is going to be warm colors (sapele/figured sapele, jatoba, cream bindings, gold hardware). It seems that the difficult part is cutting the recess for the inlay, so my choice of inlay material is probably secondary, but again, not having worked with MOP before, I'm not looking for trouble and am wondering if I should KISS by either using the pre-cut inlays, or a contrasting wood for my first time to this rodeo. As usual, any thoughts/advice appreciated. 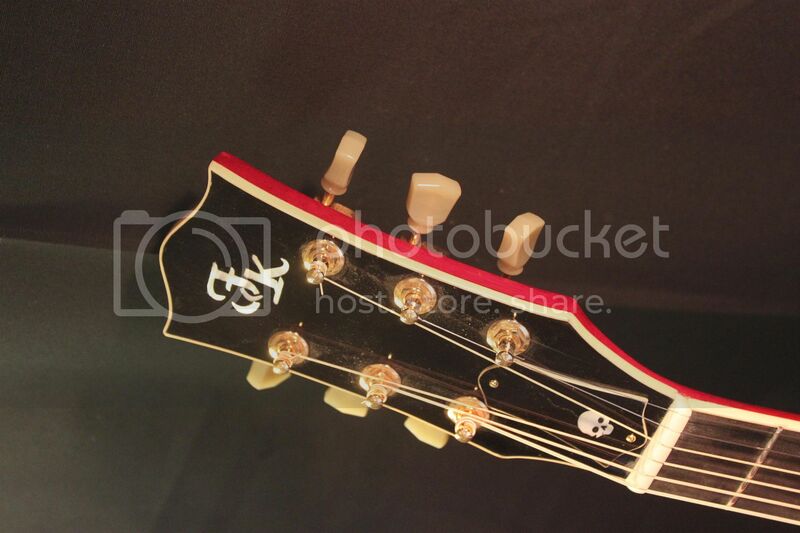 Steve, I use pearl of various kinds on my guitars and almost always buy it from Andy DePaule (and now his son). Edit to add, all of that is pre cut stuff from DePaule. 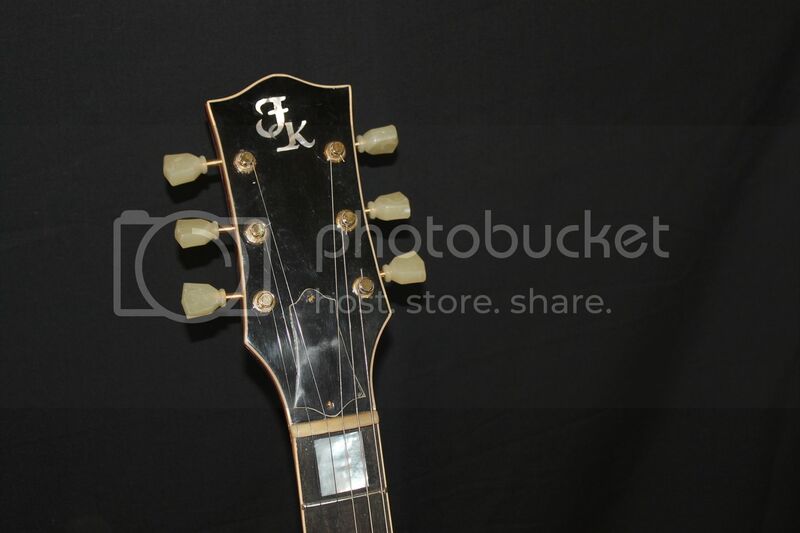 The FK initials are from his alphabet series, I cut them and interlock them when I do the inlay. The skulls and all the f/b squares are his standard cutouts. BTW I've always admired your peghead logo. Inlay is a great skill to add to your quiver. Start simple and go from there. 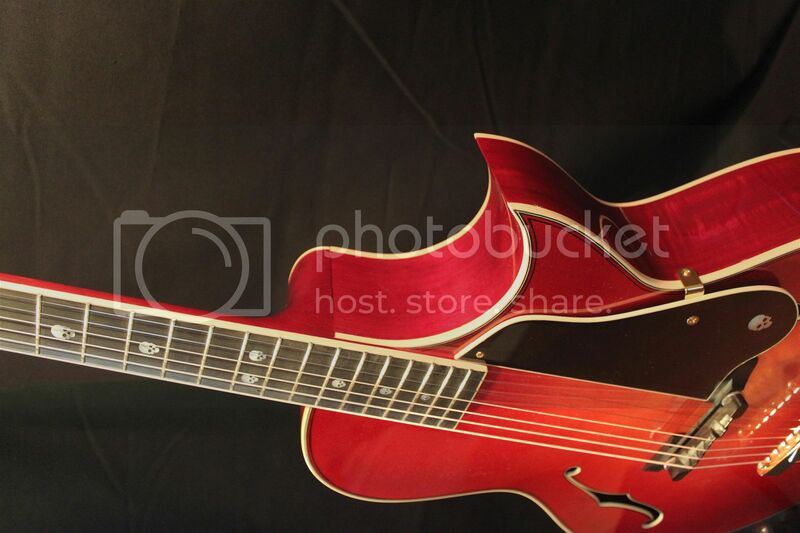 That kind of morphed into the inter twined FK - pretty easy to do, yet it makes the guitars my own. Thanks for the link - he ships internationally from Vietnam, so he can ship to Canada no problem. Brian Evans wrote: Thanks for the link - he ships internationally from Vietnam, so he can ship to Canada no problem. Not only that but he can furnish the paperwork so you can ship across borders too. 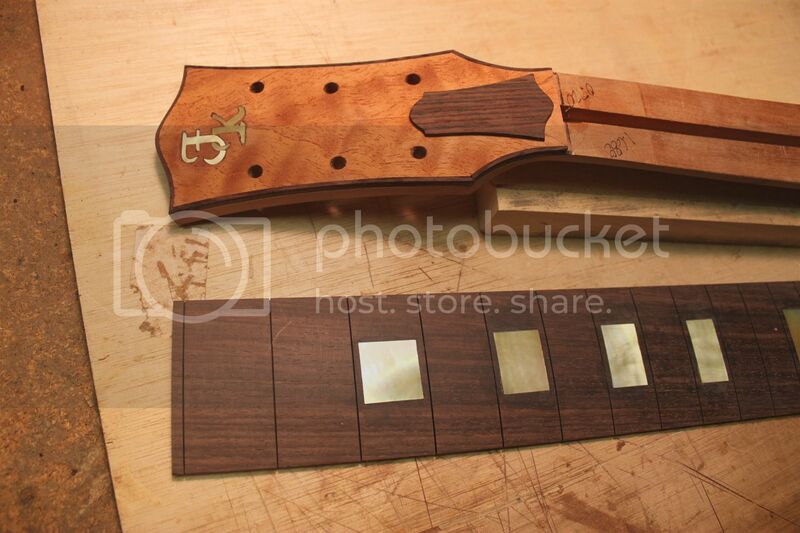 I sent a guitar from the US to Austria and Andy supplied the CITES forms for the inlay. - When you excavate the area for the inlay the bottom needs to be flat. 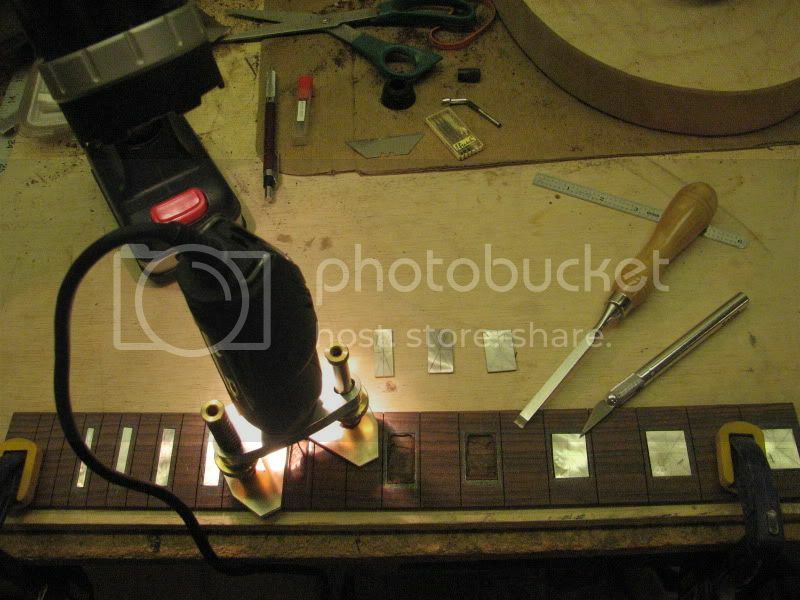 If you do it after your fretboard has been radiused your dremel base will follow the radius and the outside part of the hole will be deeper than the center. I have tried taping little pieces of flat stock to the edges of the f/b to create a flat surface, that works but is tricky. I've also tried excavating not quite to full depth and then chiseling the center down, that also is tricky. Your adhesive will partially fill the void but its best to start with a flat surface. In this case the outside edges of the blocks will be standing proud and have to be sanded down. - Sand a bit of the parent wood to get a powder and mix that with some slow set epoxy, use that to set your pearl. The epoxy will fill the small gaps and can be sanded and scraped flush with the pearl. This works pretty well with dark wood like ebony or rosewood, with lighter wood the epoxy ends up dark. - I would recommend against multiple piece inlays (like the parallelograms with the slash across them) . You will have a hard enough time lining up edges and getting that center line looking just right. 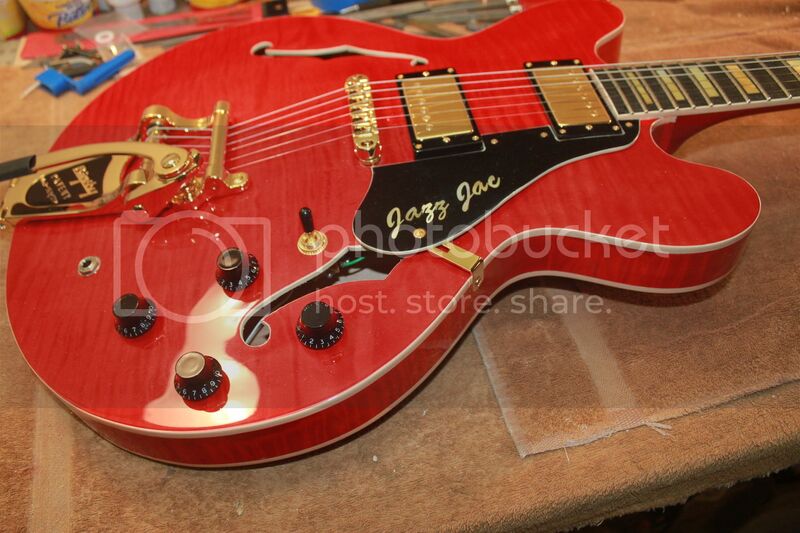 - I hold the inlay against the wood and scribe around it with an Xacto knife. I then rub pencil on the outside of the scribe line and carefully route up to the line. I've got a light right behind my router and my best reading glasses on. - You've heard my rant about deciding on a theme and staying with it. 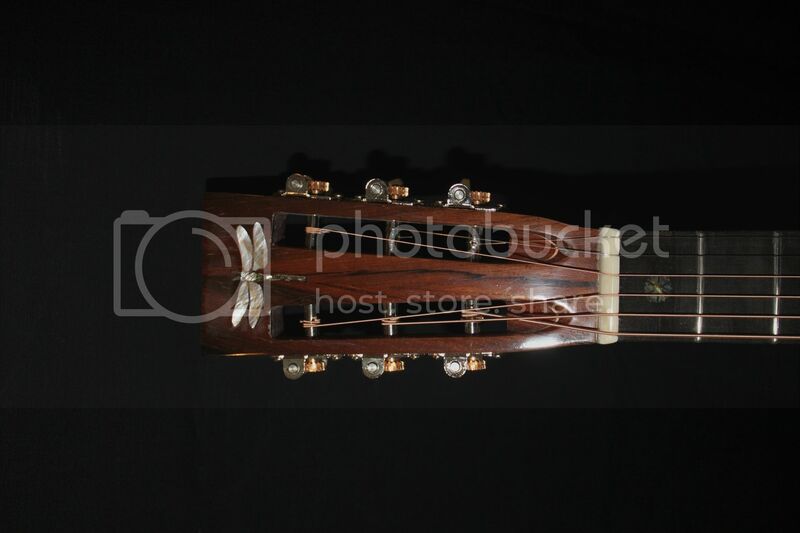 I try to keep the fretboard, head stock, any purfling or rosette on an acoustic, any other little bits all the same. I like the idea of gold MOP with your gold hardware. If you can't find what you need at DePaul Supply, he can also make it for you, for a small fee. I have sent them drawings, and they digitize them, and turn them into inlays. Very good work, for a reasonable price. They are very good to deal with. Freeman - to your point re the FB radius, my plan was to inlay first, then radius. However, my usual method of radiusing is with a router in a jig. How does MOP react to a high-speed router bit? I use a dish-cutting bit like this. 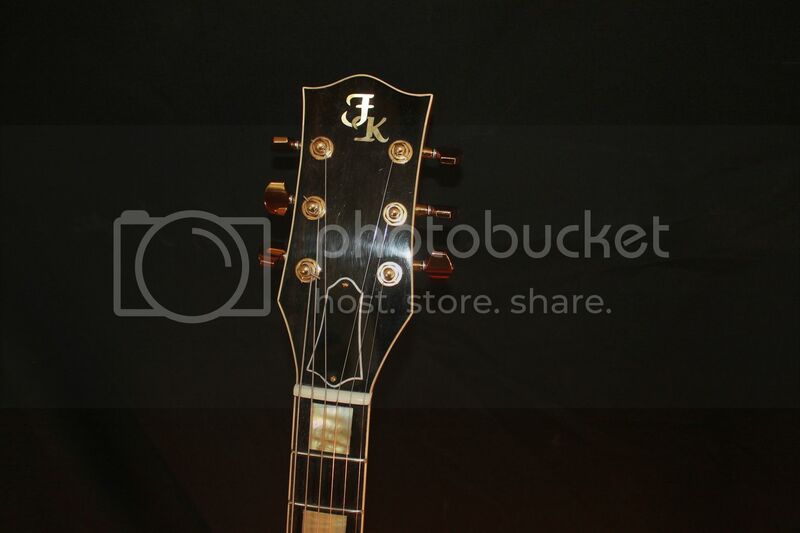 OR should I radius the FB after cutting the recesses, but before installing the inlays, and try to sand the inlays flush with the radiused FB? I can't answer your question since, as I said, I only work with pre radiused f/b's. Pearl sands but is much harder than wood - I would think that inlaying a flat board then sanding with a long radiused block would be OK. I can't say about the router but that would scare me. 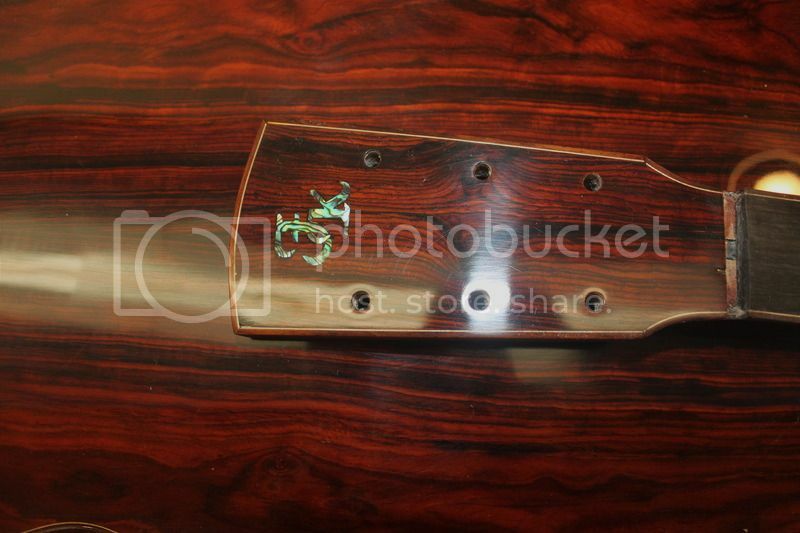 I have done a fair amount of inlay also, and I buy from Luthier Supply. As Brian noted, they ship to Canada. 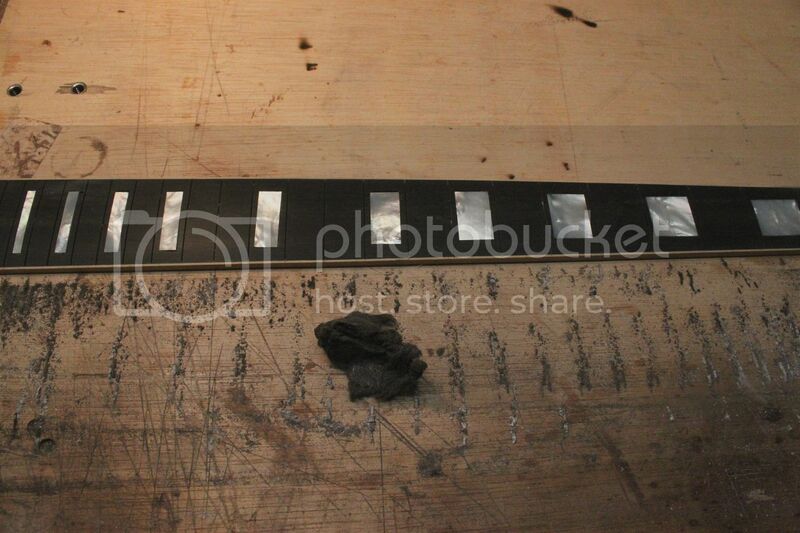 I rout the channel before I radius the fret board. I am also like Freeman, in that I'm a bit afraid to use a router on the MOP. I have the feeling it would break into pieces. I have a couple of extra pieces and I really should try it. Like Barry said, keep it simple for your first time around. Big squares are the easiest other than dots. Remember to rout in a few passes to get to depth. Those small bits don't like taking too big a bite. I rout, then radius the board. Then I glue the inlay in place. That leaves just a tiny edge of the inlay to deal with. Gordon Bellerose wrote: I rout, then radius the board. Then I glue the inlay in place. And am I correct in assuming that you deal with that tiny edge using a radius block? Steve Sawyer wrote: And am I correct in assuming that you deal with that tiny edge using a radius block? It won't be just a tiny edge - if the pearl is flush at the center it will be standing proud on the outside edges. But yes, you just start with fairly coarse (maybe 120 or 150) grit in the appropriate radius block and start sanding it down. I have used a router bit like that to radius ebony fretboards that already have block MOP inlays installed. Never had a problem with the router bit damaging the MOP. Just don't take a very big bite. Barry Daniels wrote: I have used a router bit like that to radius ebony fretboards that already have block MOP inlays installed. Never had a problem with the router bit damaging the MOP. Just don't take a very big bite. Thanks, Barry. Not sure what I'll do yet, but it's encouraging that that IS an option. 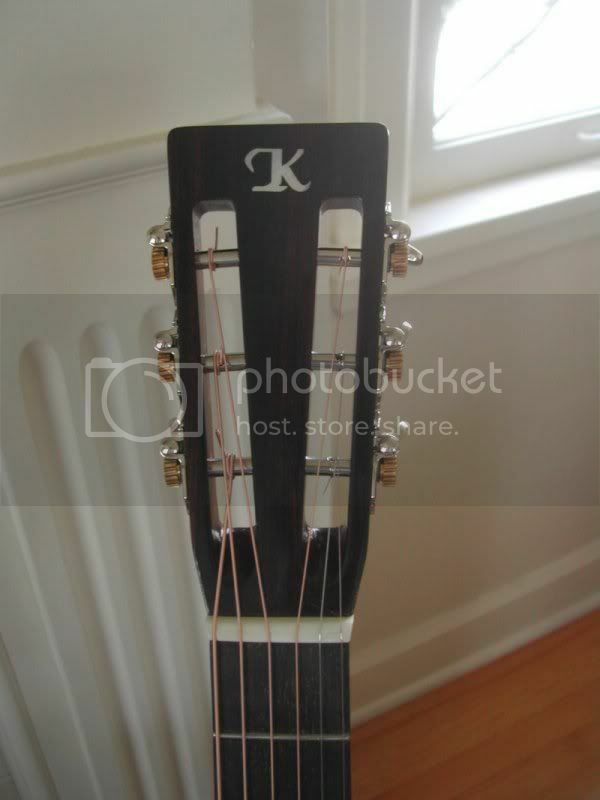 I was googling around the other day and found this: http://www.precisionbits.com/guitar-fre ... 13005.html for radiusing fretboards. Kind of cool, for $25.